The office of Los Angeles Mayor Eric Garcetti confirmed that Sunset Boulvard had re-opened around 1:30 a.m. Monday. 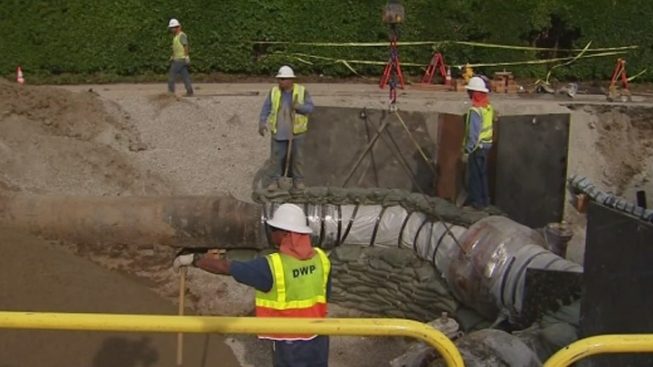 Crews on Monday morning finished repaving Sunset Boulevard after a water main break last week caused a massive sinkhole in the road near the University of California, Los Angeles campus. The office of Los Angeles Mayor Eric Garcetti confirmed that Sunset Boulvard re-opened at about 1:30 a.m. Monday. DWP re-pressurized the water main Monday morning and signs warning of rough roads were placed alongside the street. Some 20 million gallons gushed onto Sunset Boulevard and into UCLA facilities July 29, pouring into Pauley Pavillion, nearby underground parking garages full of cars and other campus buildings. The flood wrecked the brand new wooden floor at Pauley Pavilion, where the Teen Choice Awards had been scheduled for Aug. 10. About 900 vehicles were stranded in the garages, about 400 left in standing water. A fleet of tow trucks ferried the cars to another parking lot at the south end of the campus starting Aug. 1.